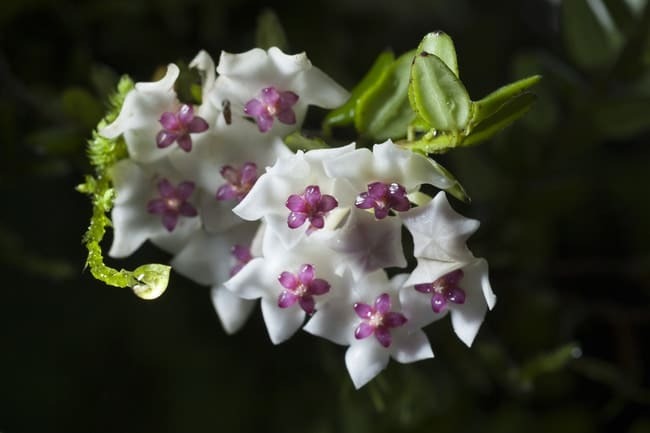 Common names for Hoya carnosa compacta include the Hindu rope plant, Krinkle Kurl, porcelain flower, and wax plant. Each of these highlights a distinctive characteristic of this unique plant. Its draping vines resemble thick ropes with their crowded, contorted leaves. These fleshy, curled leaves, which may be either solid dark green in color or variegated green and white, have an attractive glossy or waxy appearance. The clusters of small star-shaped flowers are also often waxy. And they are so delightfully perfect, they appear to be made of porcelain. Hoya carnosa compacta is a popular variety of the Hoya genus to grow as a houseplant – with good reason. This plant is great for hanging pots and ledges that will show off its verdant trailing vines. With minimal effort, you can enjoy the Hindu rope plant’s remarkable foliage for many, many years – even decades! And with just a little patience and added attention, you will be treated to its exquisite flower clusters. 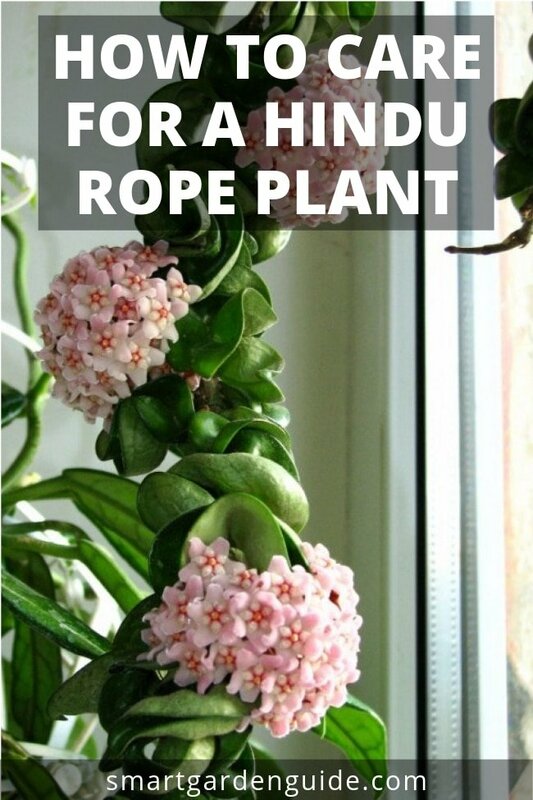 So here’s everything you need to know to take good care of a Hindu rope plant and encourage it to produce eye-catching, long-lasting blooms. The Hindu rope plant is native to southern India. Like many other types of hoyas, this species is epiphytic in its natural habitat, which means it’s actually an air plant, and its thick, crinkly leaves are succulent. Knowing these two characteristics of the Hindu rope plant may help you better understand your plant’s needs, which are in many ways similar to those of orchids, another air plant, as well as to those of other succulent houseplants such as the snake plant and the zebra plant. Basically, the Hindu rope plant is a slow-growing plant that is fairly adaptable and doesn’t require a lot of attention but will be at its best when several conditions that are beneficial to epiphytic houseplants are met. What Soil Does A Hindu Rope Plant Need? If you search the web, you may be advised to use African violet soil, succulent soil, or an orchid potting mixture for your hoya plant. You might even be told that any commercial soil mixture will work with the addition of some perlite or vermiculite. Some alternately suggest adding sand, which is often used with succulent plants for drainage; however, sand isn’t so great for Hindu rope plants because it becomes compacted, preventing essential airflow to the roots. This is where it’s important to remember that this plant is epiphytic in nature, so its roots need plenty of airflow for the plant to survive. The key factors for a good Hindu rope plant potting medium are that it is lightweight and provides both good drainage and excellent aeration. If you prefer to make your own potting mix, pine bark, sphagnum moss, clay pellets, pumice pebbles, perlite, coconut coir chips, and loam-based compost are all great options to consider. Here’s another factor to consider when choosing the best potting mixture for your Hindu rope plant: humidity. If you live in a humid climate, choose a coarser potting mixture to make sure it dries out sufficiently and provides the best drainage. If, on the other hand, your climate is dry, use a finer medium that will hold more moisture and dry out more slowly. What Type Of Pot Is Best For A Hindu Rope Plant? With its pendulous vines, Hindu rope plants make great hanging plants. Just make sure the pot it’s in is not too large for the plant, as it prefers to have its roots packed together rather tightly. A small size pot is also beneficial because the growing medium dries out more quickly when there is less of it, so it is less likely to cause root rot. These slow growers seldom need repotting, so don’t worry about your plant outgrowing a small pot any time soon. Also, drainage holes are essential for Hindu rope plant containers because they are best watered using the flood-and-drain method (see the section on how to water a Hindu rope plant). What Lighting Is Best For Hindu Rope Plants? While a Hindu rope plant may appear to do just fine in low light conditions, particularly if it has solid green rather than variegated leaves, this will cause it to grow more slowly. Also, the plant won’t blossom unless it receives very bright indirect sunlight. A south-facing window (that’s north-facing for the Southern Hemisphere, of course) is best, although eastern and western exposures may also work if they are bright enough. This plant will even tolerate a little direct sunlight; however, too much direct sunlight or direct sunlight paired with high heat will burn the plant’s flowers and leaves. Another option for the Hindu rope plant is bright fluorescent lighting. You should make sure to provide over 300 foot-candles of full-spectrum light for a minimum of 12-14 hours a day to sustain healthy vegetative growth and increase it to 16 hours a day, if you are trying to induce blooms. What Is The Optimal Temperature Range For The Hindu Rope Plant? Did you know that most common houseplants originated in the tropics or subtropics? The main reason these plants make great houseplants is because they like the consistently warm indoor temperatures. This true of the Hindu rope plant, which prefers daytime temperatures of 70 F (21 C) and above and nighttime temperatures that are about 10 degrees Fahrenheit lower, or around 60-65 F (16-18 C). What Humidity Level Do Hindu Rope Plants Need? Even though the Hindu rope plant has succulent leaves, it needs more airborne moisture than most other houseplants that are happy with the low humidity levels typical of indoor environments. Humidity levels of 40-60 percent are ideal for Hoya carnosa compacta, whereas household humidity levels are usually around 10-30 percent. To achieve the higher humidity levels, you might want to employ a humidifier, or you can set the pot on a rock-filled try with water in it to generate the humidity that this plant craves. Using a finer rather than coarser potting mixture, as mentioned above, may also help achieve the right the local humidity for your Hindu rope plant. When it comes to watering, the Hindu rope plant doesn’t ask for much. During spring and summer, when the plant is in its active growing phase, you should allow the potting medium to become almost dry before watering. During the cooler months, when the plant is experiencing its resting phase, you should cut back even further and only water the plant occasionally. To water a Hindu rope plant, flood the potting mixture with plenty of water and allow the excess to drain out of the pot, making sure to never leave the plant standing in water for more than 15 minutes, if you are setting it in the sink or using a watering tray. Do Hindu Rope Plants Need Fertilizing? The Hindu rope plant also doesn’t need much fertilizer. This light feeder is generally happy with a monthly feeding during its vegetative growth period, which starts in mid-spring and continues throughout the summer. However, you should never fertilize a Hindu rope plant while it is blooming or going through its resting phase in the fall and winter. Use a balanced water-soluble plant food that’s diluted to half the recommended strength. Just remember that too much fertilizer is more harmful to a Hindu rope plant than not enough. Signs of over-fertilization include: dry, crinkled leaf edges; new leaves that are small; tips of new vine growth dying off; and a white crusty residue on the surface of the potting mixture. If you believe that your plant is suffering from too much fertilizer, flush the potting mixture thoroughly the next few times you water – or consider repotting the plant (see the section on repotting below). How Do You Propagate A Hindu Rope Plant? The most reliable way to propagate Hoya carnosa compacta is with stem cuttings. Using clean, sharp pruning shears, cut at an angle to remove a section off the tip of one of the plant’s vines that includes at least one pair of leaves. You can either place the bottom portion of the cutting in water, making sure to remove any lower leaves so they are not submerged, or in a dampened lightweight growing medium to root. Rooting hormone may help, but it isn’t a necessity. How Do You Get A Hindu Rope Plant To Bloom? There are a few things you need to know about the Hindu rope plant to make sure it will not just produce healthy foliage but will also bloom. The most important thing to know requires a quick botany lesson. This plant’s spectacular round flower clusters are called umbels, and they are formed by twenty or more small flowers that extend on short stalks from the tip of a main flower stalk known as a peduncle or spur. These spurs are perennial, which means they remain on the plant after the blossoms fall away and produce new flowers each season. So if you cut the spurs back, those flower nodes will be lost forever and the plant will need to develop new spurs before it can bloom again. Another important aspect of getting a Hindu rope plant to bloom has already been mentioned: bright indirect sunlight. Without this, the plant may keep growing, but it is unlikely to ever produce any flowers. The third aspect that is essential for blooming – and this is the one that requires a little patience – is the plant’s maturity. Some plants bloom in the first year, while others take a couple of years to get there. 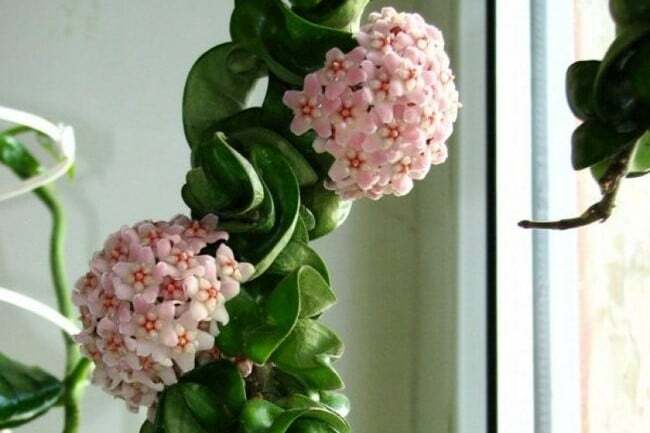 The length of time it takes a Hindu rope plant to reach maturity and begin blooming depends on the growing conditions, so you’ll want to make sure you are providing optimal care to your Hoya carnosa compacta, as outlined here, from the get go. It seems that being root bound may also be an important condition for blooming, although it’s unclear if this is really the case. The best time to repot any plant, including the Hindu rope plant, is in spring to midsummer, when the plant is entering its growing phase. But you should avoid repotting when the plant is in bloom, as it may cause the flowers to fall away. Of course, if it’s an emergency, then you gotta do what you gotta do to save the plant. Choose a new pot that’s no more than 2 inches (5 centimeters) larger in both depth and diameter than the pot you are replacing. I hope you’ve enjoyed this article. If you’d like to start growing this wonderful houseplant, head over to Amazon and pick up a Hindu Rope Plant now.